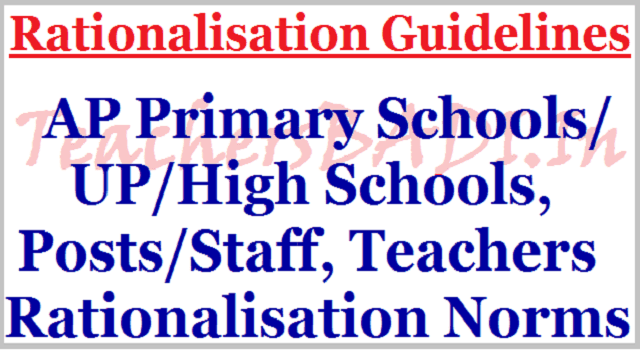 AP Schools, Posts, Staff/Teachers Rationalisation Guidelines 2017, AP Primary/UP/High Schools, Posts, Teachers Rationalisation Norms 2017, Salient norms for the proposed rationalization of schools, posts and teachers 2017. (i) Consolidation of Primary Schools may be taken up as per G.O.Ms.No.39 Education (Ser.II) Department, Dated:07.08.2015 to G.O.Ms.No.51 Education (Ser.II) Department, Dated:07.08.2015 (pertains to respective districts) based on the integrated U-DISE 2016-17. The cut of date for student enrolment is 31.3.2017. (ii) The eligible Primary Schools with over and above 80 enrolment may be designated/converted into Model Primary Schools and allocated 5 Teachers. (iv) The Primary Schools with less than 30 enrollment within 1 KM radius where there are no other schools within 1 K.M. radius may be continued. (v) Allocation of Teachers to Primary Schools shall be on the basis of norms indicated in Table·1. (vi) After 340 enrollment, for every 30 additional students, one SGT will be provided. (vii) On completion of the entire Rationalization exercise, if any working SGT are found surplus in the district, such teacher shall be allotted in the descending order to <80 enrolment primary schools. In case of surplus SGT vacant post, such posts shall be kept in the District Educational Officer pool for further utilization based on need. (viii) The LFL HM posts shall be provided to the Primary Schools having student enrolment of 131 and above. Where L.F.L. H.Ms are working in the schools having 130 and below student strength and are not covered under compulsory transfer, such LFL post may be adjusted against the justified SGT post in that school. (ix) On Rationalization of primary schools where SGT is not justified, the junior most SGT in that school shall be transferred to needy school. (x) All efforts should be taken to minimize single teacher schools in the district. (xi) In Scheduled area <10 schools may be continued, if there is no scope for consolidation. <40 enrolment respectively may be downgraded as Primary Schools. The students may be accommodated in the nearby High Schools I U.P. Schools within 3 KM radius. Eligible Transport allowance may be provided if the accommodated school distance is beyond 3 Km radius, based on RTC rates. (ii) Recommended Staff Pattern for Upper Primary Schools shall be on the basis of norms indicated in Table II-A ft B. (iii) Upper Primary School having VI 8.: VII classes with enrollment 60 and above can be straight away be upgraded into a full-fledged High School from 2017-18 onwards by opening VIII class, provided there is no High School within 3 K.M. and subject to availability of required infrastructure facilities in the school. Such school shall be provided staffing pattern as indicated in Table II (B). Necessary proposals may be submitted. (iv) Elementary cycle Upper Primary Schools having VI to VIII classes with enrollment 80 and above can be straight away be upgraded into a full• fledged High School from 2017-18 year onwards by opening class IX, provided there is no High School within 3 K.M. and there is availability of required infrastructure facilities in the school. Necessary proposals may be submitted. (v) Wherever a High School I Upper Primary Schools is available within 3 KM radius from the existing UP school point, the Upper Primary classes shall be consolidated with the nearby High School I Upper Primary School. (vi) On downgrading an U.P. School, if the strength of such a Primary School is 80 and above, it shall be treated as Model Primary Schools. (vii) In case required SA posts are not provided to U.P. Schools as per Table II A ft B due to non availability of surplus sanctioned posts, surplus SGT post may be allotted to ensure comprehensive instructions in the school. Required additional training may be provide to such SGT so as to handle quality instructions to the students. (viii) The staff pattern for Primary Sections in Upper Primary Schools shall be as per in Table - I. (i) The staffing pattern for High School shall be as indicated in Table lll·A above, including Success Schools. (ii) A High School with less than 75 enrolment in any media it shall be treated as non viable and may be consolidated with nearby High School within 5 KM radius from the existing school Point. (a) If the enrolment in either Telugu or English Medium is <75, such schools may be consolidated to nearby Success High Schools or may be limited to a single medium in consultation with S.M.C. I S.M.D.C. of the school. (b) If the enrolment in English Medium in Success Schools is >60 to <140, 4 Teachers (i.e. 1 S.A. (Maths), 1 S.A (P.S), 1 S.A (B.S) and 1 S.A. (SS)) shall be provided in addition to the staffing pattern defined in Table Ill.
(c) If the enrolment in English Medium Is >=141 to 240 the staff will be additionally provided as a separate Unit as per the Table - Ill, except Head Master Post and Physical Education Teacher Post. (d) If the enrolment in English Medium in Success Schools is > 500, additionally 1 Head Master Post and 1 P.E.T. post will be provided exclusively for English Medium Success School for improving academic and administrative monitoring. Where there are surplus Head Masters, they may be provided to such separate English Medium Success Schools in descending order. (iv) Eligible Transport allowance to the students is to be provided, if the students have to go beyond Skms in case of nonviable merged high schools, based on RTC rates. ii. The recommended staff ·pattern for additional provision of subject teachers in Minor Medium I Parallel Medium High Schools is as per Table III-B in addition to Table lll·A. iii. for major medium enrolment for calculation of requirement of Teacher posts Table lll·A and for Minor Medium enrolment Table lll·B are to be followed in the Minor Medium I Parallel Medium High Schools. Guidelines for effective implementation of the scheme of Rationalization etc. HM of a school has to prepare time tables as per the Part I of the Table shown wherein subject-wise weightages are given for each class. On the basis of these weightages, the staff patterns are designed, he has to plan for effective implementation of the curricular and co-curricular subjects on daily basis Time tables teacher wise, subject wise, class wise are to be prepared by the Head of the institution keeping in view the optional subjects studied by the teacher at Table 2, graduation/Post graduation level and methodology subjects studied in Teacher Education course. The following examples would make the point clear. The optimum strength of a class in a High School (for each of VI to X classes) is 40. The maximum strength of a class is 60. Hence the sections to be formed for a class shall be as per the table given below. HM of a High School has to handle minimum 8 periods per week which includes handling one curricular subject of part I of Table for either class X or class IX in accordance with his optional subjects of study in graduation/post graduation and his methodology subjects in B.Ed course. HM has to distribute periods of workload equally to all teachers as far as possible keeping in view not only subject designation of the teacher in question but also actual optional subjects of study .of the teacher at graduation/post graduation levels, and methodology subjects at B.Ed,B.P.Ed,TP/LP. If necessary group subjects of her/his study at +2 levels also to be kept in view. For better comprehension, certain examples have been given under item 16 below, as guidance for the HM to frame the time table. All teachers can be allotted the activity subjects/ co curricular subjects of Part I of the Table like work education/computer education, art and cultural education/Health and physical education. value education/Life skills/Library periods etc. 1. According to staff patterns in Table lll·A, teachers are provided to SUCCESS schools. The medium in the tables is mentioned only for the purpose of provision of teachers. But the HM can utilize services of all teachers for both media. No teacher shall refuse to handle English medium classes. 2. Specialist teachers like PET, Craft etc are common for both media/parallel media schools. The provision of such common teachers shall be according to total enrolment of the school. 3. Vocational instructors available are to be rationalized into C.l.Posts. Still on requirement as per staff pattern, the SMC of the school may engage part time instructor in accordance with provisions available in the schedule of the RTE ACT 2009. CSE may give guidelines in this regard for engaging part time Art Education I PETs I Craft instructors. 4. The second P.E.T post in a coeducation High School shall be exclusively for a woman. 5. Where school assistants (Languages) are deficit, Language pandits can be posted against S.A (I Language/II Language) posts. viii) Computation of Teacher posts required for a school as per staff patterns now proposed. i) In respect of a High School having only one medium, (Single Medium) straight away Table Ill-A is to be followed for calculating teacher posts required for the school. Step1: Number of posts required for non language curricular posts for major medium enrolment from relevant enrolment slab of Table III-A. Note: Table III-A shall be taken for major medium enrolment for calculation of teacher posts. Step 3: The remaining posts required to be calculated are as per the combined enrolment of both media from relevant combined enrolment slab of Table lll·A. Combining the posts in step 1,2 and 3 will give the total posts required for that Parallel Medium High School. The following example would make the methodology clear. I. Examples for Calculating requirement of Teacher posts In Parallel Medium High Schools. From Table Ill-A, the Teacher Posts required for the School as per the above enrolment. 1. For the school, there are 5 classes I Sections (VI to X), with workload= 6 days X 8 periods X 5 classes = 240 periods per week.